Scratched MirrorSomething was used that has scratched my 6x4 ft bathroom mirror! Is there anything I can use make it less noticeable. It looks like the glass is easy to leave a mark on. Is there such a thing as soft glass? Portable Dishwasher SuggestionsI will soon be shopping for a dishwasher. My kitchen is small and cupboard space is limited. I will probably need to purchase a portable model. Does anyone have any suggestions as to a make and model? Thank You. Styling Advice for Wavy HairOk, I'm called the "Beauty Freak" because I read and apply everything! Yet nothing works! Removing Marker From a BasketballHow do you remove marker from a basketball? Is 13 Too Young to Have a Boyfriend?My daughter asked if she could have a boyfriend today. It worried me that she will start things early. She is 13 and I'm not sure if she's ready. Any opinions? Styling Strawberry Blonde HairI'm going into high school and I want my hair to be different but funky and good looking. I have strawberry blonde hair and I want to know what color of low lights or unnatural color (like pink, purple, etc.) would be compatible with my hair color. 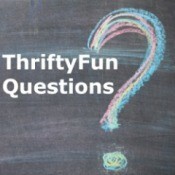 Painting Mint TinsI have a question about using mint tins for crafts. Do you have to prep the tins before you paint or decoupage? If so, what kind of preparation is necessary? Graham & Brown Pattern #92178I need 1 or 2 rolls of Wallpaper Border by Graham & Amp; Brown pattern #92178 blue flowers on a trellis.